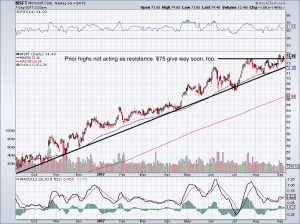 Stay long MSFT stock on the strength and potential of its cloud and artificial intelligence units. 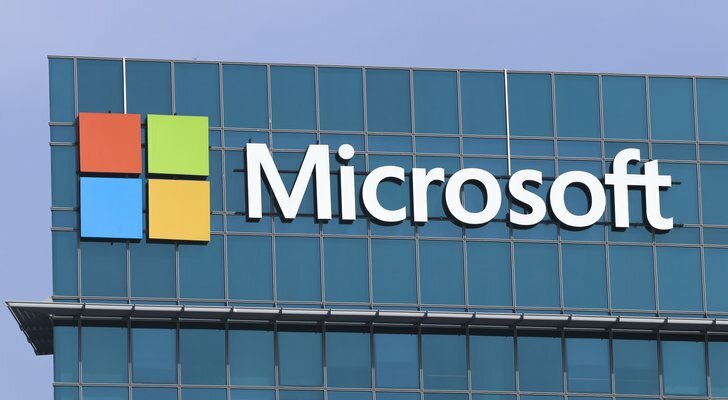 Microsoft Corporation (NASDAQ:MSFT) may not be the most exciting tech stock in the market. All the buzz is for companies like Amazon.com, Inc. (NASDAQ:AMZN), Apple Inc (NASDAQ:AAPL) and Alphabet Inc (NASDAQ:GOOGL, NASDAQ:GOOG) to hit a market cap of $1 trillion. Not so MSFT stock. But just because this topic gets investors talking, doesn’t mean Microsoft should be ignored. In fact, because of two businesses — one existing, one nascent — MSFT stock should be a core holding in every tech investor’s portfolio. Microsoft has a pretty sizable cloud business with its Azure lineup — a collection of cloud-based services for developers and IT professionals. After seeing companies like Amazon, Google and salesforce.com, inc. (NYSE:CRM) report earnings, it’s clear cloud momentum remains strong. Azure revenues grew 97% year-over-year last quarter, helping pave the way to an impressive earnings beat for MSFT. Amazon may be the market leader, but MSFT is a formidable No. 2. Additionally, the market here continues to grow and there’s more than enough sales to go around without completely sacrificing margins. There are two other underestimated reasons to bet on Microsoft’s cloud: Many cloud services are subscriptions. The one-time sales are gone and this will be important for Microsoft the farther out in the future we go, as it continues to generate sales and earnings from prior customers will still recruiting new ones. The other reason: Amazon’s retail dominance could also be its downfall… well, sort of. As AMZN continues to pressure the likes of Wal-Mart Stores Inc (NYSE:WMT) and Target Corporation (NYSE:TGT) — particularly after its $13.7 billion acquisition of Whole Foods Markets, Inc. — the retailers are fighting back. Not just in the aisles and online, but with suppliers and vendors, too. TGT has announced its intentions to leave Amazon’s AWS platform this year, while WMT is pushing its vendors to dump AWS, too. More companies that are feeling the pinch from AMZN could use TGT’s strategy in the future, too. While it’s a hassle to switch cloud providers, why should retailers aid the enemy? Waiting in the wings is Azure. If this trend continues, it will could be a big win for Microsoft. Meanwhile, Microsoft is nowhere near being finished with the cloud. To be sure, all the futurist talk surrounding robots, deep-learning, artificial intelligence and self-driving cars can make it seem like the cloud is already in the past. That’s not the case, though, as demand for the cloud continues to rise at a remarkable pace. Still, that doesn’t mean Microsoft shouldn’t be looking ahead. Realize it or not, big-tech knows where the next trend will come from. CEO Satya Nadella has been efficient in leading MSFT; axing mobile, acquiring LinkedIn and overhauling Microsoft’s cloud business. With the cloud business now humming, he’s turning his attention to AI before the trend gets underway. This will help carry Microsoft into and through the next decade. It’s difficult to note MSFT’s progress here. But the fact that they are readying for the next great technology overhaul should bode very well for shareholders. Leading up to August, we were stalking MSFT stock. In the first week, we saw a great entry opportunity as it retested support. 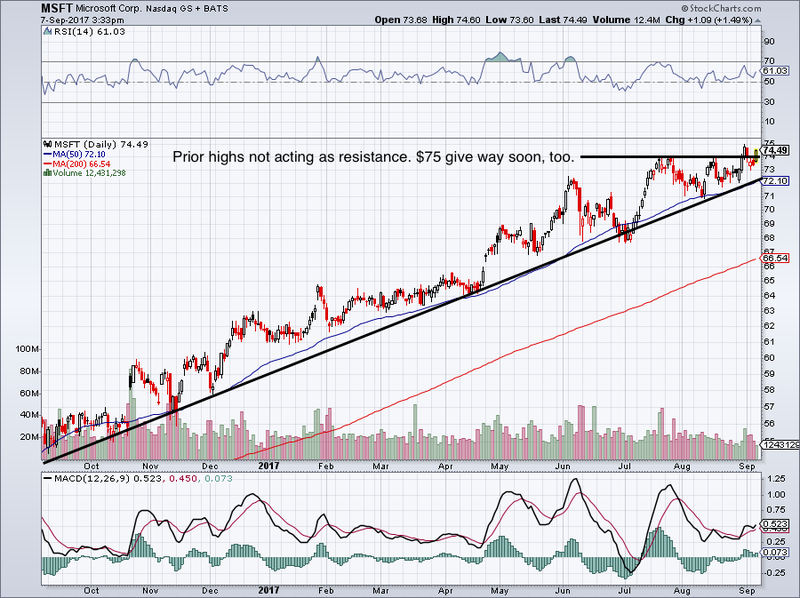 Microsoft is in a strong uptrend. The 50-day moving average is almost hidden by our black trend line and the 200-day moving average looks like its own straight red line — very out of the ordinary for most stocks. Put simply, MSFT stock is churning higher. It recently made new highs and it looks like that trend should continue pending a market-wide correction. Some investors may not agree with the valuation or the stock’s strong rise. However, I would argue two points: MSFT stock deserves its higher valuation thanks to higher growth. AND, Microsoft does not have the negative catalysts needed to knock the stock down. In this case, the path of least resistance is higher. 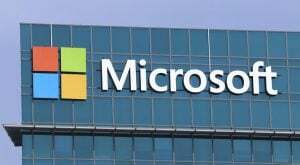 Article printed from InvestorPlace Media, https://investorplace.com/2017/09/microsoft-corporation-msft-stock-is-a-buy-thanks-to-2-businesses/.